Female macroptera. Body and legs yellow, fore femora external margins shaded brown, abdominal segments IX–X brownish yellow but particularly shaded near posterior margins; antennal segment I white, II brown, III pale with extreme apex shaded, IV–V pale with apical quarter light brown, VI–VIII brown; fore wings and all major setae pale. 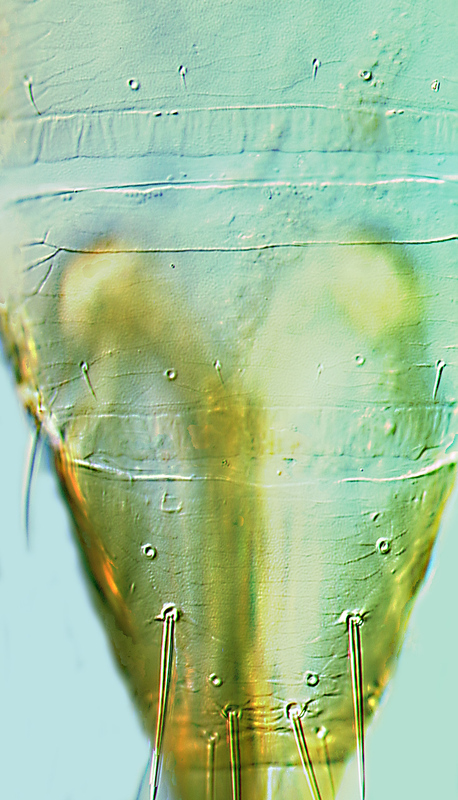 Antennae 7-segmented, I with no dorso-apical setae, III–IV with sensorium simple. 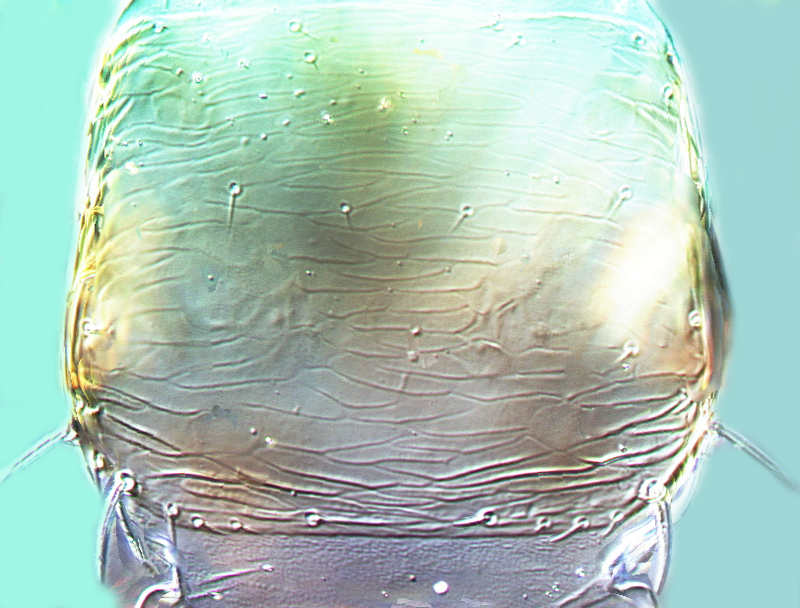 Head projecting conically in front of eyes, cheeks almost parallel; compound eyes with 5 pigmented facets; ocellar setae III 1.0–1.5 as long as an ocellus and arising between anterior margins of posterior ocelli; mouthcone large, maxillary palps 2-segmented. Pronotum slightly wider at posterior than anterior; posteroangular inner setal pair shorter than outer pair. Prosternal basantra with no setae; ferna continuous medially; meso and meta furca without spinula. Mesonotal anterior campaniform sensilla present. 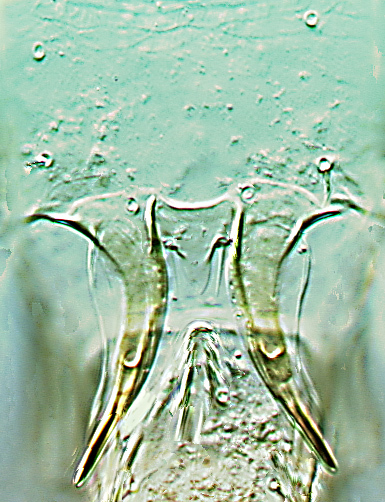 Metanotum weakly reticulate medially, median setae varying in distance from anterior margin; campaniform sensilla absent. Fore wing slender, first vein with 3 widely spaced setae on distal half; second vein with few widely spaced setae; clavus with 4–5 veinal setae, no discal seta. Tergites with weak transverse sculpture medially; II–VIII with craspedum present, campaniform sensilla near posterior margin; tergite IX median dorsal setae slightly stouter than posterior setae, extending just beyond tergal posterior margin, posterior marginal setal pair I shorter than pair II; X with median split incomplete. 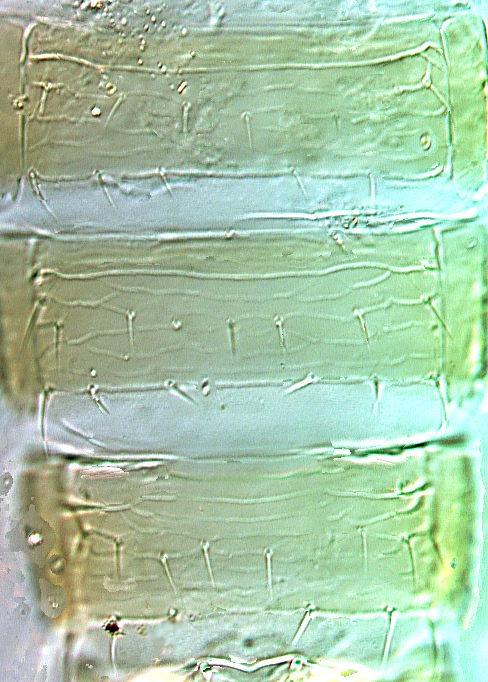 Sternite II with 1–3 discal setae, III–VII with 5–9 discal setae; II with 2 pairs of marginal setae, III–VII with 3 pairs, all arising at margin on VII. 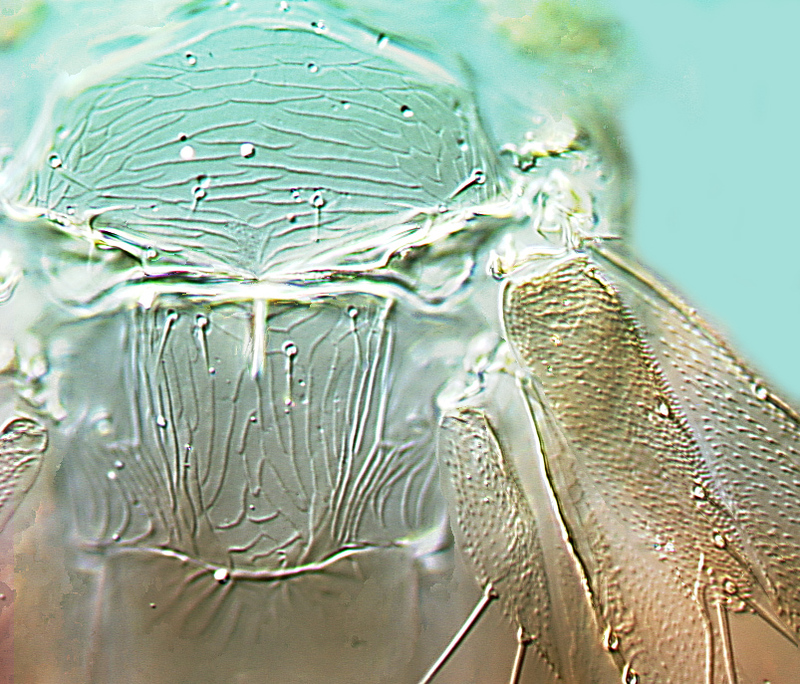 Male macroptera. 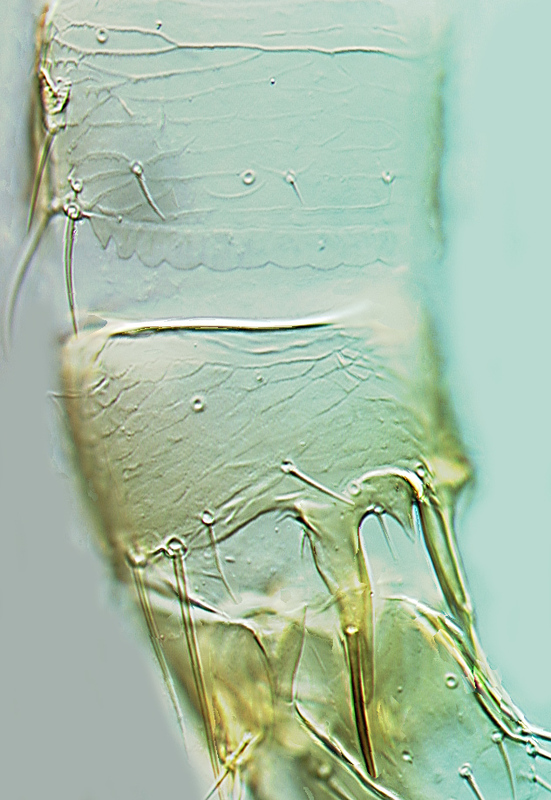 Smaller and paler than female; tergite IX with pair of elongate curved processes; sternites with no pore plates. The genus Aliceathrips comprises five species, all from the northern half of Australia. 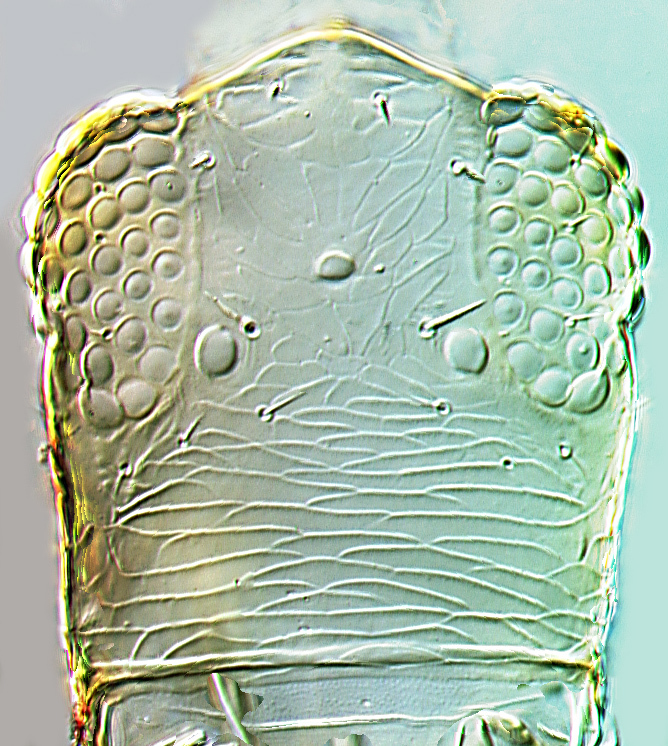 A. mnestes is similar in structure to A. australiensis but differs from all of the species in this genus in having the antennae 7-segmented instead of 8-segmented. The male has no sternal pore plates.